Summer Is Here and it’s Time to Take a Hike! For dog lovers, there is nothing quite so satisfying as watching your dog running up and down a trail through your local state park after a long week of being stuck inside while you are out at work. For those of us who have long jobs, and long commutes to those jobs, we probably live with a little bit of a guilty conscience when we come every evening to see our dogs laying in boredom on the living room couch. 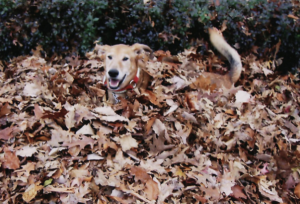 The best way to make it up to your dog is to get him or her outside as often as possible. 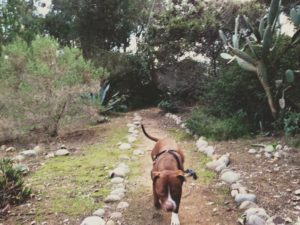 While dog parks are always a good option, what dogs really need is a place to feel unburdened by fences and boundaries; a place where they can explore and enjoy the world around them. Nothing is better for that than taking your dog hiking. Here are five ideas for how you and your dog can most thoroughly enjoy your time out on the trail. Dogs get hot, and when you´re walking up and over mountains in 90-degree heat, your dog will love nothing more than coming to a cool, shady creek where he or she can cool off. 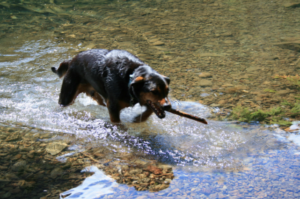 When looking for places to hike, try to find a trail that either goes by a creek or rivers, or ends up at a lake or pond where your little friend can cool off. 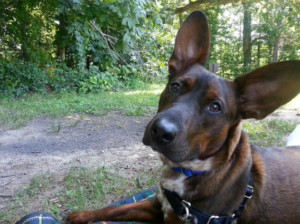 Unfortunately, there are many hiking trails around our country that are closed off to dogs. If you are lucky enough to have found a place that allows for dogs, make sure that it stays that way by sticking to the basic rules of dog-hiking etiquette. Always keep your dog in sight when not on a leash, and when you see hikers approaching, call your pup to your side, get to the side of the trail, and let the oncoming hikers know that your dog is friendly. This will help avoid any unpleasant comments at the local ranger station that could lead to closing the trail to dogs in the future. J ust because you feel guilty for having left your dog indoors for far more time than what you wanted doesn’t mean that you must “physically” carry that burden with you. 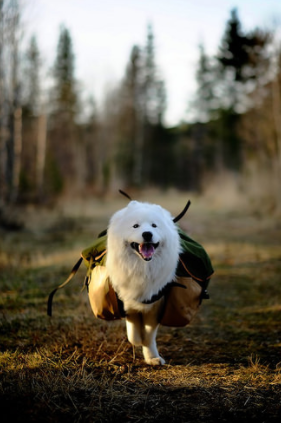 When on the trail, give your dog a job of his or her own and let them carry their own weight, literally. There are several dog backpacks that can be efficiently and comfortably strapped to your dog´s back so that he or she can carry their own water and any other snacks, treats, or toys that you think they might enjoy later on down the trail. For a great comparison guide of the top dog backpacks on the market today, check out this article at LiveOnceLiveWild.com. One of the absolute best parts of hiking is coming to that gorgeous overlook of the valley below, finding a snug place on the forest floor with a thick mattress of pine needles, and relaxing into a deep sleep as the gentle rays of the sun warm you generously. Just as you enjoy a relaxing power nap during a hike, your dog will most likely do the same. Though their energy levels may be through the roof at the outset of the hike, by the time you´ve done a few miles, they will probably more than likely be willing to snuggle up by your side for a quick sleep. Hiking during autumn comes with several added benefits. The temperature is generally a little cooler, the sky is crisper and bluer, rains are uncommon in most areas, the color of the leaves is simply astounding, and best of all, there is an abundance of leaves covering the trail to make a pile to jump into. While some people might consider this an activity for children, after a long day hiking, there is nothing quite so nourishing as raking up a big pile of leaves to jump into. Your dog will quickly pick up on the game and the two of you can celebrate the end of the trail in fashion. Most importantly, you need to let your dog know that you are happy to be there spending time with him or her. After too much alone time indoors, your pup needs the extra attention and care and the best way to give him or her the devotion they need is by taking them into the great outdoors. This entry was posted in Blog and tagged dog adventures, dog lovers, dog owners, dog training, dog training products, dogs, hiking, summer. Bookmark the permalink.